Russ & Kelly are a husband-wife team on a mission to give old lumber new life as handcrafted furniture, décor, and home goods. Each piece from Timber + Main is inspired by their love of the wilderness and their pursuit of living as sustainably and beautifully as possible. We salvage much of our lumber from small farms in Northern California. This wood from historic barns and ancient fence posts tells rich stories of American pioneers, ingenuity, and tradition. We also work with urban lumber from trees that are no longer able to thrive in urban areas and must be removed. By repurposing this lumber rather than sending it to the landfill, we give these trees a new opportunity to share their history and wisdom with us. We design each piece with a focus on highlighting the unique features of mature lumber. 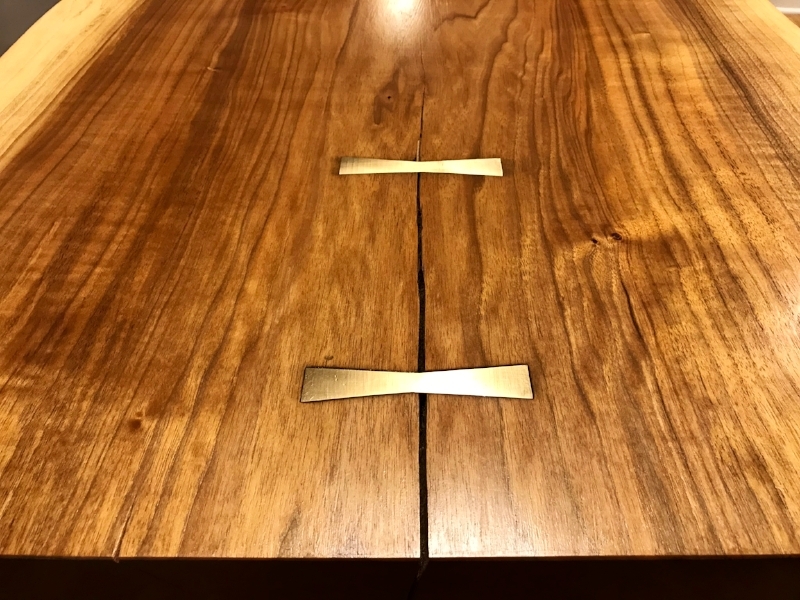 By incorporating natural grain patters, old nail holes, and live edges, we bring each piece to life by honoring the history of the wood itself so that every product tells a special story. We believe healthy forests contribute to healthy communities and a healthy planet. That's why we donate a portion of our profits to environmental non-profit organizations. We've opened our online pop-up shop for one very special item. Check out the one-of-a-kind slab table that’s been keeping us busy for over a year! Russell was born a tinkerer. As a formally trained design engineer, he combines his knowledge of structure and function with his eye for clean, classic design. In addition to his building and design expertise, Russell is a stellar rock climber, a sarcasm aficionado, and a constant percussionist. When he's not drafting new designs or sequestered in the shop, you can usually find him napping on the floor with the dog. Kelly was born a boss lady. With a degree in biological sciences and a stint as a duck biologist, she ensures furniture designs, project timelines, and tool purchases are in line with Timber + Main's mission. Kelly is a stellar blogger, a to-do list aficionado, and a reluctant power tool user. When she's not blogging or sanding, you can usually find her hiking through the forest and talking to the trees. Stay up to date on our current projects and shop shenanigans and be the first to find out each time our online store re-opens!